Here are a few news regarding tiger protection from Newsletter "Saving Tigers in the Year of the Tiger". (I) The work of Signature Drive keeps going broadly, (II) Mr. Ming-Kang Dai is exclusively interviewed by Shanghai broadcasting show "Citizens and Society", regarding the enthusiasm of tiger protection in San Francisco Chinese community. In China, "Citizens and Society" is the very first show which directly broadcasts the talks from leaders in western countries. President Clinton has directly talked to people in Chine through this show. (III) The delegation of American Chinese Zhi-Qing Intellectuals Association visits the tiger's hometown, Heilongjiang province in the northeast China. 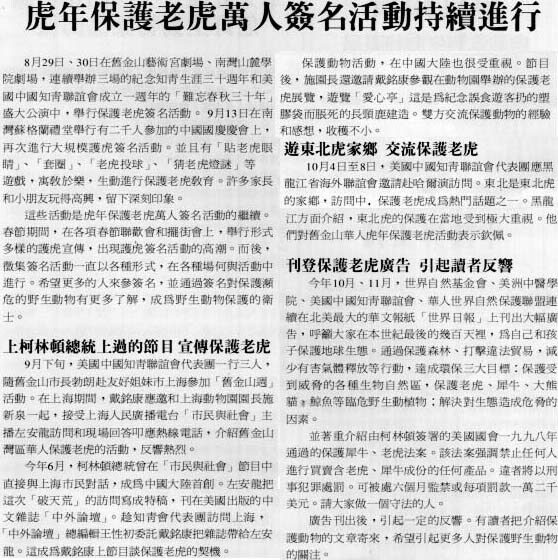 (IV) The advertisement on the World Journal, the largest publication Chinese newspaper in North America, receives great response. Previous article : "Tiger Conservation" - A Chinese American and Wildlife Conservation Working Conference. Next article : "Stop Illegal Trading in Tiger Products & Rhino Horns! ".